My youngest had the misfortune of getting his first bee sting this evening. I knew something was wrong when he told me he was playing with a bug. As soon as the word stop was out of my mouth he started screaming because he had been stung by the 'bug'. Luckily pain medication and a baking soda paste saved the day. He is now asleep and I'm pretty sure that he won't be playing with bees again soon. Luckily before the be incident my family enjoyed a family favorite, sloppy joes. For dinner I tried a new recipe for Turkey Sloppy Joes from the May 2013 issue of Family Circle magazine. This recipe has 13 ingredients. It takes 3 hours and 15 minutes of total time, 15 minutes of which is active and makes 12 servings. I followed the recipe pretty closely to the original. I always have baby carrots for my husband's lunch so that is what I used in this recipe. Since I only had smoked paprika I substituted it for regular and Sunny Buns for the hamburger buns. Of course my youngest slightly smashed my photo bun before I got the picture, hence why it looks a little lopsided. I ate my serving over brown rice. My kids loved this recipe. I did find that it only made about 5 servings, not the 12 suggested by the recipe. My husband thought that he would have liked fewer carrots, I thought that it was a little sweet. Overall though this was a very family friendly recipe and I like that it uses turkey instead of beef. 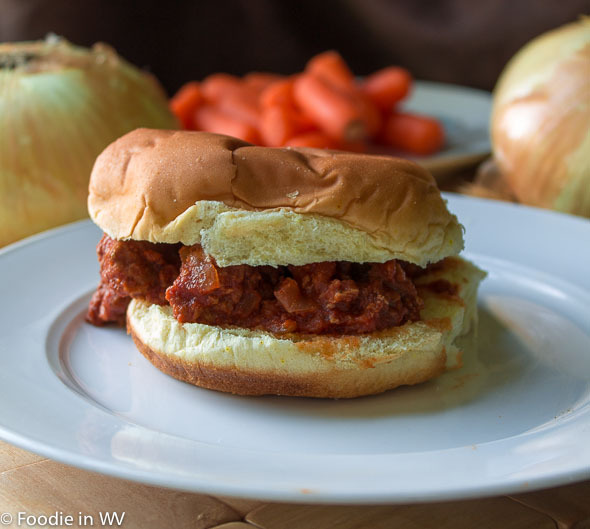 For the recipe go to Turkey Sloppy Joes. Registration required. I find that often times recipe serving suggestions are off, but to say there is 12 servings and it only made 5 - that's pretty far off. That looks amazing. I am always looking to make something a little healthier. I never thought about making my sloppy joes with turkey. I am happy your little one is doing well. Thanks :) My son is much better today, he says that his bee sting is all gone! I love sloppy joes, they are the best! Love it! I also make my own version of turkey sloppy joes with 99% fat free turkey and add in things like red kidney beans too. Delicious! Thanks for linking up at Family Fun Friday. I might try this recipe. I've never thought about using turkey for sloppy joes even though I use it as a substitute for most other recipes. I use turkey often as a substitute also. It's a great way to reduce the fat!